Statement on Em Mijares’ shirt reads “Sometimes it is necessary to shout so that those playing deaf can hear.” Photo from @xianneangel. The student leader was promptly dragged by elements of the Presidential Security Group and police off the premises and arrested. The security forces then allegedly forced him to swallow the banner he unfurled during the lightning protest and put him in jail for 24 hours. Mijares was freed only after posting bail to the tune of P8,000 (around $US200). Criminal charges were also slapped on Mijares for allegedly causing “tumultuous disturbance” and the “assault upon an agent of a person in authority.” His protest action has been described as a case of “heckling” against the president in most mainstream media reports. The young activist did not feel any remorse for his lightning protest and instead saw it as his own contribution to a growing mass movement calling for genuine reforms. Massive anti-pork barrel protests set off that very day with 10,000 taking to the streets of the national capital Manila and thousands more in other major urban areas across the country. Many Filipinos have decried the persistence of the pork barrel system, or the use discretionary lump sum funds for the pet projects of government officials, in spite of the Aquino administration’s anti-corruption rhetoric. the heckler should suffer the consequences of his action. alarm and scandal are crimes defined and penalized under the revised penal code. this is a police matter pure and simple. he could have delivered his message to the president by writing him a letter. but to heckle the highest official of the land is sobra na. good manners and right conduct must be observed at all times. The long standing problem — one that many in the public share is a single blindness to uncivilly. Online, and offline, yes, you may disagree with Noynoy Aquino the man, but where does that disagreement end, and respect for the office begin? What Pio Mijares did is still a political act, a political expression, and it speaks volumes about the kind of political action you can expect from those who share his beliefs. Yet the treatment of him speaks something about the kind of politics that this administration subscribes to. The latter is far more damning than the former. Prof. Sarah Raymundo of the University of the Philippines meanwhile praised Mijares for his activism. In disrupting the president’s speech, Emmanuel embodied the people’s desire for change. The banner he held shows that the act was an organized plan fuelled by collective daring. Like many of us who took to the streets on the same day, he was righteously agitated, his slogans were radical. But only he had owned the chance to show the president how uncompromisingly empowered we are as a mass movement. Welp. That Em Mijares episode is not helping our president's case, is it? Just let the kid go. Really. 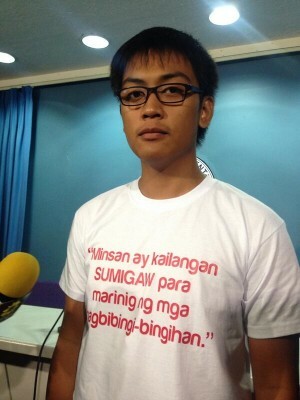 Student Em Mijares from Ateneo de Naga arrested for denouncing Aquino. Aquino et al still free despite stealing billions from Filipinos.